Create Embellish Adore: O MOTHER OF PEARL!!!! When I found these cute little pearls, I didn't know what I was going to do with them... and then I sat on them for a long time. 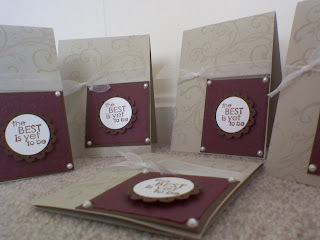 I tried to use some for the christmas mistletoe, and then it dawned on me that I needed to use them for 'pretty cards'. 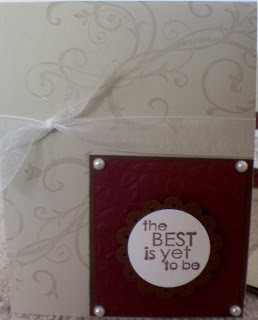 So here is my first attempt at a pretty card..
You cannot see the little holes on the scalloped edge, nor do you see the texture on the burgundy color CS. I like it. Maybe the "Best is yet to be"